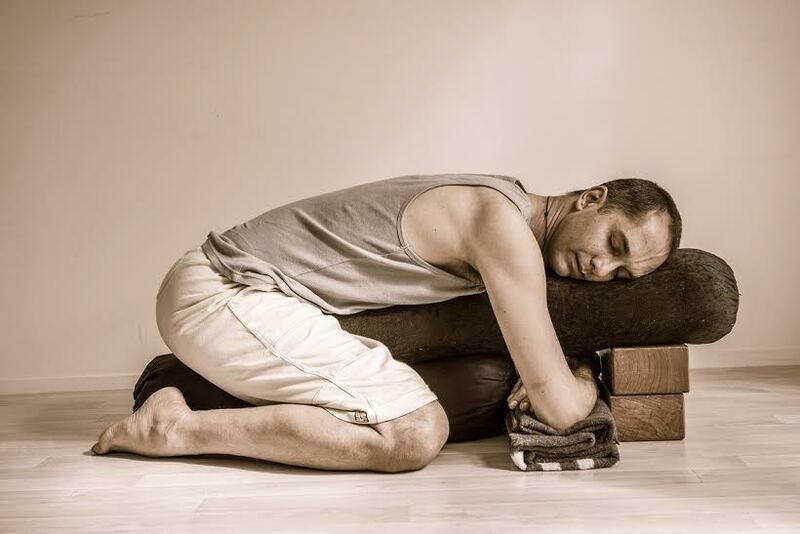 A little while ago I wrote an article on the eight essential principles of Restorative Yoga. Since then I’ve been continuing to delve deep into this beautiful practice. Deep rest is always calling! I’m happy to be sharing some more … and one of the most profoundly restful of the Restorative postures is Supported Child’s Pose (Salamba Balasana). This is a posture which many find deliciously comforting and relaxing, perhaps because it tunes us into a time when we rested as children. There are a number of variations, some with more props, some with less, the one above being a favourite. 1. Place a bolster in the middle of your mat, and stack two blocks about 8 inches in front of this bolster. The blocks should be at least the height of the bolster, if not higher, otherwise there would be a downward feeling to the posture. 2. Place the second bolster on top of the first, stacked so that it is also supported by the blocks. This allows for a space to sit upon on the bottom bolster. 3. Fold 2 or 3 blankets into a long rectangular shape and place them in between the bolster and the blocks. These are for the arms to rest upon. 4. Make sure the blocks are not placed too far from the bottom bolster otherwise the top bolster may begin to collapse downwards, which would also result in your body collapsing downwards. 5. To come into the pose, sit on the bottom bolster and ease your body forwards onto the top bolster, so that the front of your body is fully supported by the bolster. There should be no feeling of collapse, and if there is, come out of the pose and re-adjust the props and positioning so that you feel fully, beautifully supported. 6. Ease the head out to one side. Your sit bones ideally should remain on the support you are sitting on. a. An extra folded blanket under the buttocks may relieve some knee pressure and also some lower back pressure. The whole back should be very gently rounded – if there seems to be too much of a rounding in the lumbar region of the back, the blanket under the buttocks may help ease your lumbar back towards a more neutral position. b. A folded face cloth carefully positioned under one cheek may help to reduce discomfort in the neck as it reduces the angle of rotation in the cervical spine. c. Discomfort in the knees may be reduced by placing rolled up face cloths just behind the knees. First move up on your knees, then place the rolled up face cloths behind the knees. As you sit back down, roll the flesh of the calves back and outwards. the rationale here is to create space behind the knees, which may alleviate discomfort. d. There are a couple of possibilities for ankle discomfort. Firstly, raise the whole setup on two or three blankets and then position yourself so that the ankles are placed on the back edge of these blankets with the feet releasing off them. Or possibly a thin oval-shaped blanket roll under the front arch of the ankles may also help. e. Consider an extra blanket or even two on top of the top bolster to create greater support for your torso. As always the setup is individual depending on the structure, condition and size of each person. Always in Restorative Yoga be as generous as you can with blankets and other props – offering this kindness as a gift to yourself. This in itself could be a radically transformative for your life. 8. Once you are settled in and very comfortable, you can cover your body with a nearby blanket (or ask a friend). Sometimes people like to bring a blanket right over the top of the head (allowing for a little opening around the face to make it easier to breathe) – this creates a cocoon like experience – internal, calming and settling. 9. The pressure against the front of the body may tone the organs and stimulate the parasympathetic nervous system and the exhalation phase of the breath is well supported. 10. Allow yourself to be fully supported here so that you can melt down into the props, trusting them to offer their full support. Allow any tension across your back to ease into softness and receptivity. Allow the jaw to release, and along with the jaw, the shoulders to relax and be spacious. 11. Invite the inhalation into the back body. Feel the breath move up to caress the back surface of the body, and the exhalation to recede away from the skin and move downward back into centre. 12. Give yourself great permission to release any holding of tension and melt further into the pose. 13. When the time feels right, gently, in slow motion, turn the head to the other side. 14. When you feel complete with the pose, again, slowly, mindfully, peel yourself up to sitting and take some time to feel and enjoy the effects of Supported Child’s Pose. Chronic back pain from for example: spondylolisthesis, spondylolysis, spinal stenosis, disc disease, nerve symptoms such as radiating pain, difficulties with bowel or bladder. Tight knees and hips can be an issue. Consider placing a blanket under the buttocks, or small flannel rolls behind the back of the knee. Also a blanket under the whole posture so the knees have some cushioning. With tight ankles, consider a folded blanket under the knees and legs but not under the feet, so that the feet release off the blanket (supporting the front of the ankles). Sometimes tightness and discomfort in the knees and ankles may mean that Downward Facing Savasana is a better option, offering similar benefits. Pregnancy: After the first trimester, it is possible to still practice Supported Child’s posture by moving the top bolster forwards enough to allow space for the growing baby and belly. 1. Simpler setup with just one bolster and a blanket. Or with just two bolster set up in a T shape. 2. If the tight knees and/or ankles make this position not suitable, consider Downward Facing Savasana as a great alternative. Here you lay your torso face down on one bolster, support your forehead on a folded blanket (just a little lower than the bolster) and support your ankles with another blanket roll. 3. 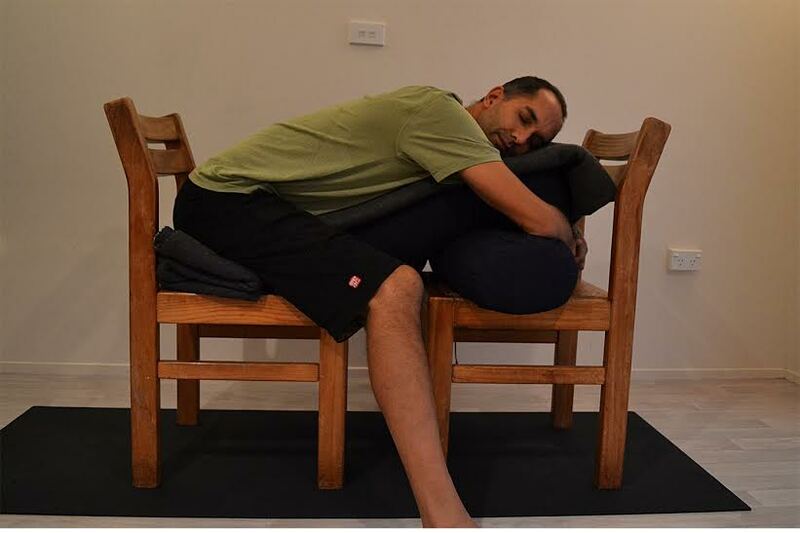 Using chairs by sitting on one chair with a bolster between the thighs and folding forwards. the other chair supports the other end of the bolster. Depending on your height, you may have to adjust by either sitting on a blanket so that your knees are lower than your hips, or placing a block under your feet so that you are grounded. This version is great if the more classic version of Supported Child’s Pose is inaccessible due to painful knees or ankles. 4. Using chairs by kneeling on a bolster or a stack of blankets are draping your torso forwards from the hip crease onwards onto the seats of two chairs positioned close to each other. Search for a neutrality in the spine, particularly in the lumbar region. If the blankets you are kneeling on are too high your pelvis will be too high too, if the blankets are too low, you’ll end up rounding your lower back. You can rest your forehead on the edge of the seat of the second chair. Reach your arms forwards. this version allows for a lengthening of the whole spinal column. The props under the knees should be high enough to create a neutrality through the lumbar spine. 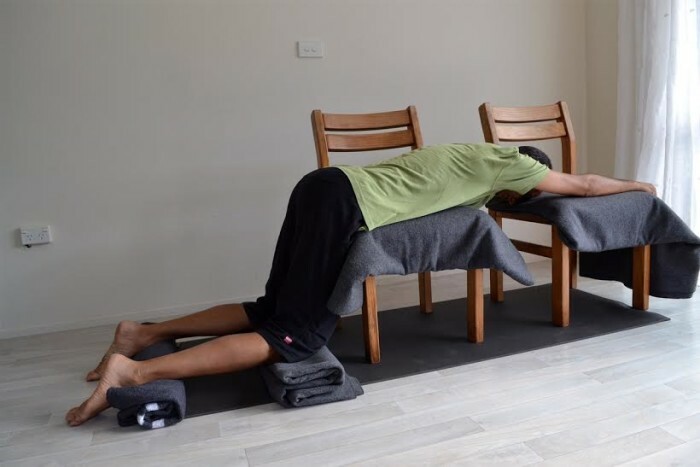 In this variation, you could also move the front chair slightly off centre so that one side of your body is slightly elongated … it now becomes an asymmetrical supported child’s pose. This asymmetry could be therapeutic for someone with scoliosis if set up so that it helps to gently open the compressed part of the spine. 5. With these variations and with all Restorative Yoga, use the props in a way to make the posture more comfortable (know that this sometimes means removing props too, not just adding them). This nourishing weekend will include active yoga, long restorative practices and iRest™ yoga nidra. Restorative Yoga is a safe, nurturing and truly joyful practice. Karla and Neal are highly skilled and passionate about this approach and welcome you this retreat, a place where you may return home to a body and mind that is at ease and fully vibrant. Full details on the Sacred Moves website. This article would not have been possible without the support, teachings and writings of Donna Farhi, Karla Brodie, Judith Lasater and BKS Iyengar and others. My heartfelt gratitude always. The information provided in this article is strictly for reference only and is not in any manner a substitute for medical advice or direct guidance of a qualified yoga instructor. Please do consult your health care provider and obtain full medical clearance before practicing yoga. 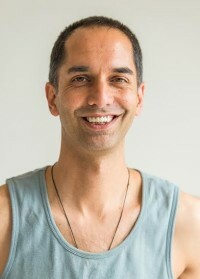 Neal has been practicing yoga for seventeen years and teaching since 2003. 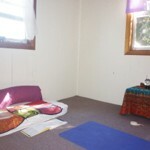 He sees yoga as a map guiding us home to a place of peace and relaxed openness in each moment. He enjoys creating a safe and inviting space in which to learn and discover yoga as a balance between effort and effortlessness, structural alignment and organic fluidity, mindfulness and spontaneity. Neal teaches as part of the faculty on Donna Farhi’s Advanced Teacher Training, and on Integrated Yoga Teacher Training in Auckland. Neal and his colleague Karla Brodie also offer Restorative Yoga Teacher Workshops in New Zealand and Australia.